Wet grinding is rare in western cuisine but common in Indian cuisine. Wet grinders are used to make pastes from grains and lentils, such as those used in cooking dosas and idlis in South Indian cuisine.These grinders generally consists of a few granite stone plates that are rolled against another stone plate with the items to be ground between them. 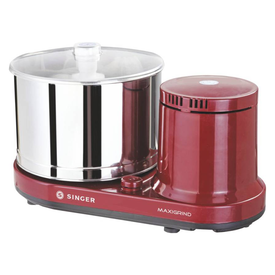 Wet grinders have two advantages over electric mixers or blenders. First, the stone grinder generates less heat than a mixer; heat affects the flavor of the food. Second, the stones remain sharp for a greater time than do metal blades. Wet grinding is rare in western cuisine but common in Indian cuisine. Wet grinders are used to make pastes from grains and lentils, such as those used in cooking dosas and idlis in South Indian cuisine.These grinders generally consists of a few granite stone plates that are rolled against another stone plate with the items to be ground between them. Wet grinders have two advantages over electric mixers or blenders. 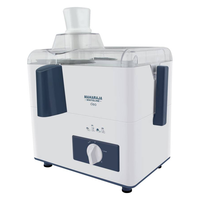 First, the stone grinder generates less heat than a mixer; heat affects the flavor of the food. Second, the stones remain sharp for a greater time than do metal blades.